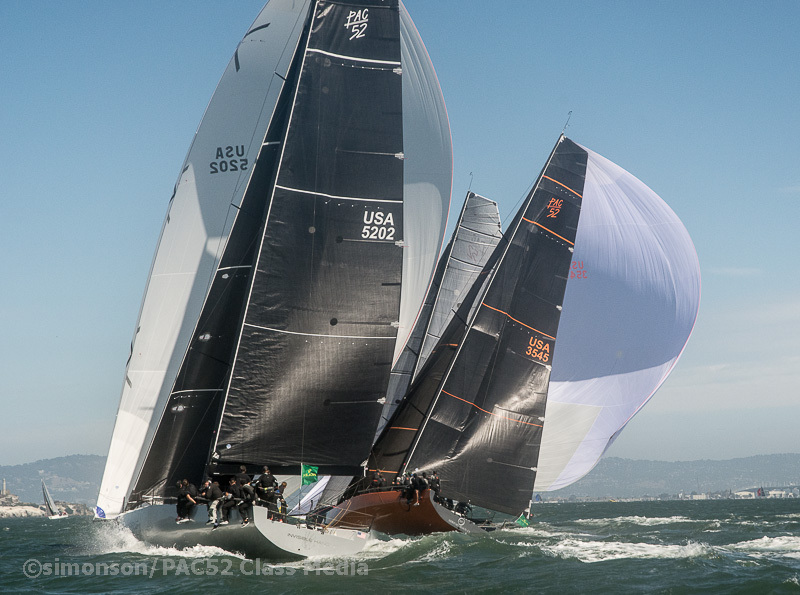 Sunshine, big currents, and wide variety of winds provide the PAC 52 a superb variety of challenges in the 1st two races of the StFYC Big Boat Series sponsored by Rolex. 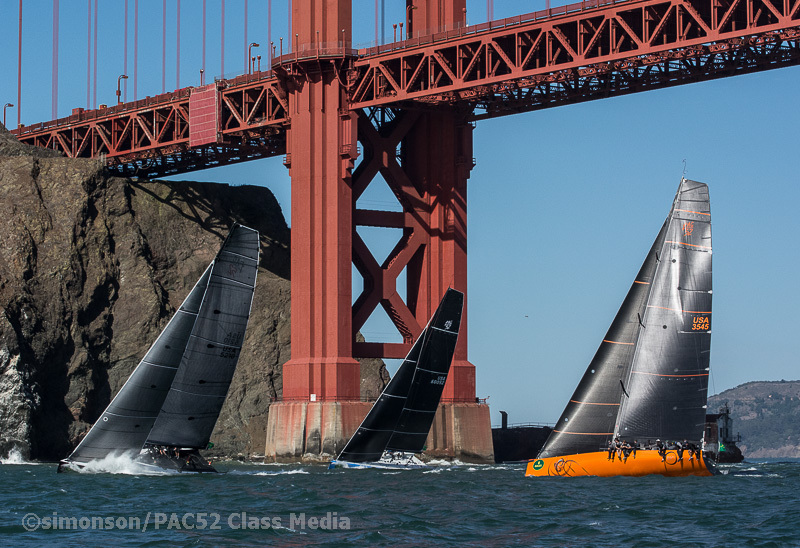 A short delay to low tide preventing the deeper draft boat kept the 52’s from starting until noon on the Alcatraz Course for race one. 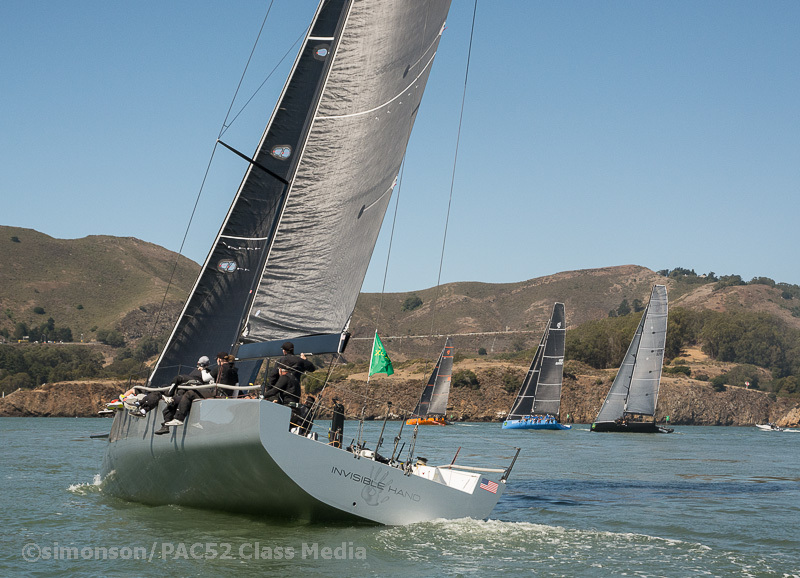 In near billiard table flat conditions thanks to a healthy flood, the fleet march straight up the course toward the 1st mark, Point Diablo just outside the Golden Gate. In 8-12 knots, the boats made quick work of the leg, working their way to the current relief of Lime Point in the shadow of the North Tower. While the land mass provides current relief, the towering bluffs also provide wind turbulence and the line between breeze and no breeze can be very fickle. 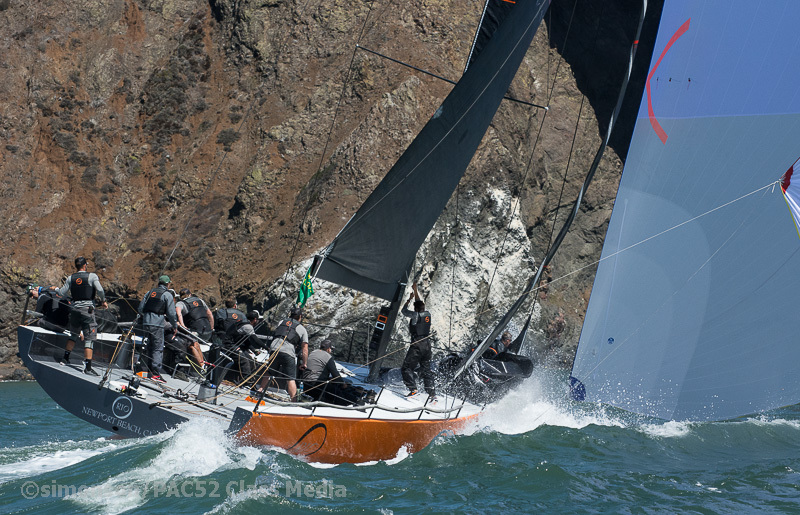 Tom Holthus’s BadPak and Manouch Moshayedi’s RIO started off with impressive speed and led the boats to Lime Point, working very close to shore, with Austin Fragomen’s Interlodge in close pursuit. 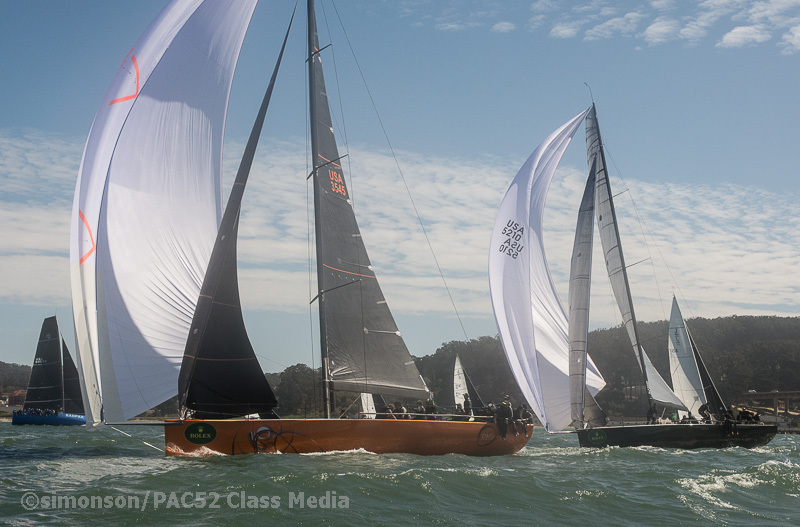 Coming in from a more center Bay approach, Frank Slootman’s Invisible Hand arrived just in time to receive a surprise starboard tack maneuver courtesy Interlodge which forced them into the no wind zone, helplessly watching Interlodge pull away. Rio would lead BadPak around the weather mark at Point Diablo by 18 or 19 seconds and Interlodge by 2 minutes and The Hand by some 5 minutes… So much for close competition, right? 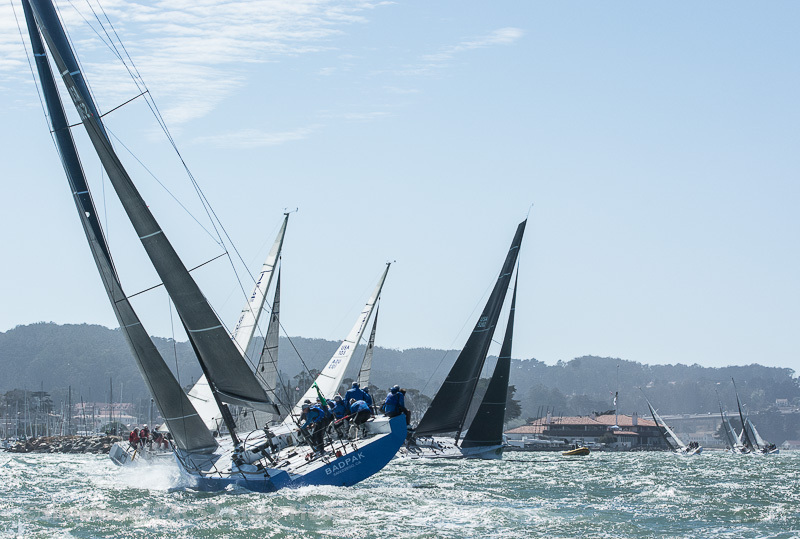 While Rio led the fleet on the downhill run back to the Alcatraz Gate, BadPak closed the gap significantly and rounded just a couple boat lengths in Rio’s rear-view mirror. Meanwhile Interlodge had halved the deficit at the gate while The Hand utilized their downhill speed in an attempt to climb back in the race. 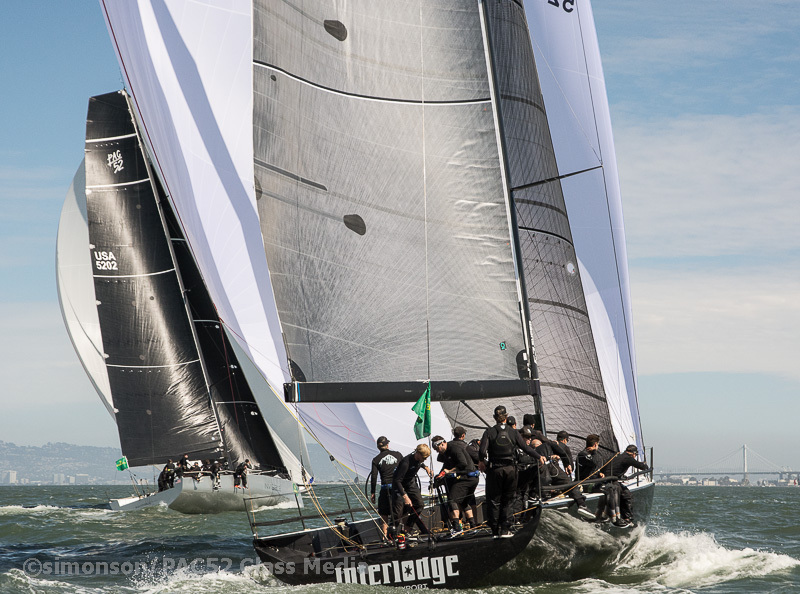 Unfortunately for them, matter turned south when a headsail kerfuffle forced the to sail bald headed for 10 or so minutes while the corrected matters. When it rains, it pours. Rio was well on their way to another first place mark rounding as the reached Lime point again and worked their way along the previously mentioned wind /no wind zone. That when BadPak pounced, short tacking RIO with a starboard maneuver that sent RIO into Irons. OUCH… BadPak would round Diablo Point with a 45 second advance, But Rio was NOT giving up. A quick Jibeset and Rio was in better current and stronger wind near the North Tower and looked primed to reel them in. 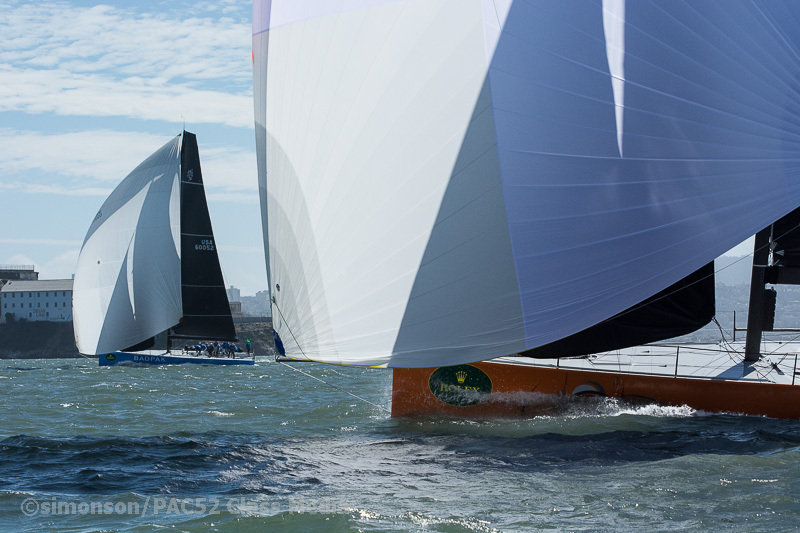 The lead, however was just two great, advantage BadPak, giving them the 1st bullet of the regatta. 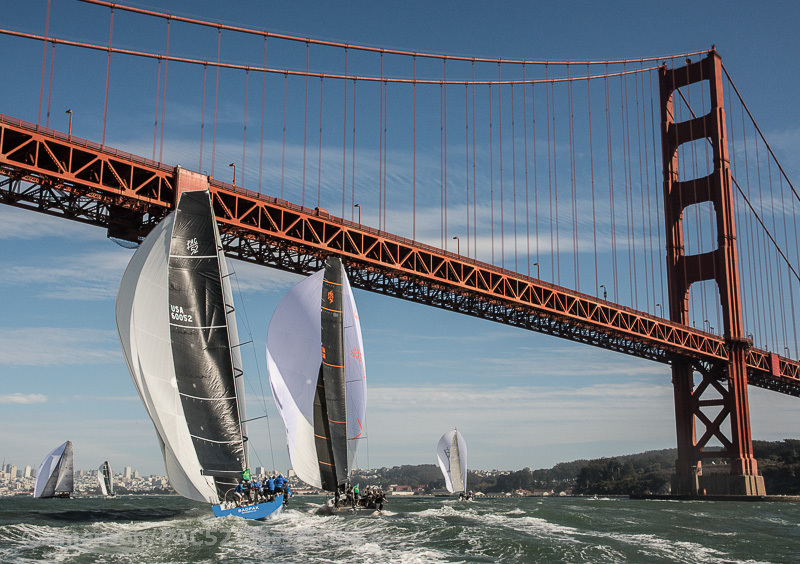 Race 2, now at the Treasure Island Course saw The Hand’s bad luck streak continue, receiving a rare OCS at the start and forcing them to give the fleet another advantage. With winds now perking up to the high teens, the fleet worked their way up the Alcatraz cone, moving toward the City Front and the mass of J-105’s short taking along the shoreline in the building ebb. The breeze had switched to a distinctively SW direction and with the ebb, was now in the 25 plus knot range. Between the moving landmine of boats headed west, another fleet of fast moving asymmetrical boats from ORR B were blasting east, living on the edge indeed, the sound of glass vs carbon impact never did occur, amazing in itself. The boats arrived at the 1st weather mark, Blackaller with RIO just ahead of Interlodge and The Hand. They set in puffy 20 plus knots in tight formation and had traveled a few hundred yards before chaos took hold. With a loud bang heard for some distance, RIO’s spinnaker tack blew and while attempting to mitigate the kites wild ride, spun out forcing Interlodge to perform an emergency gybe to avoid collision and moments later The Hand had to throw the helm over to avoid collision. Amazingly, The Hand benefited greatly, recovering quickly and taking the lead on the long ride down the edge of the Berkeley shoals with Interlodge nipping at their heels. RIO meanwhile would wrestle with their kite for the next few minutes, Allowing BadPak the chance to catch and pass as they worked their way down the course. 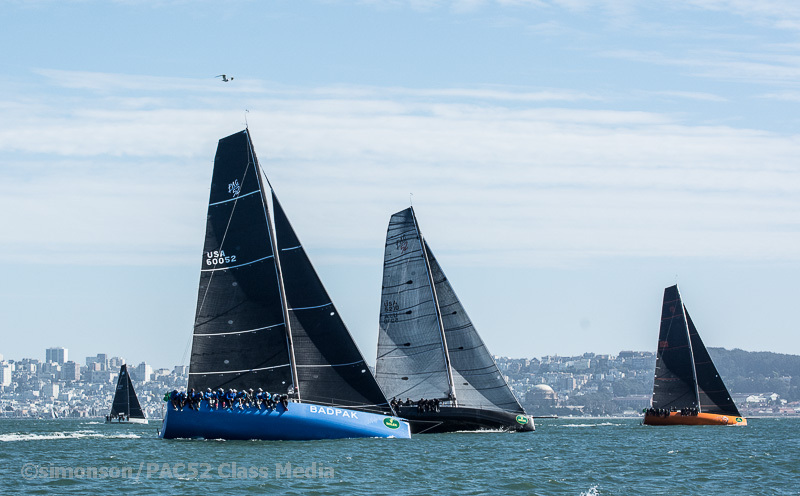 Rio would get back in control and on her feet, with her and BadPak closing the gap at the leeward mark, and the fleet became unified again!